it says “stewards” the page continues from the right to the left. like pacman. I stumbled on your brand model while searching for something else. I must say that I stopped everything else and then stayed on your map for the rest of the day. Quite an impressive effort!!!! This is great diagram for how things used to work. I’d like to see a version of this diagram that accounts for the realities of the web as seen in the past few years, as social media and increased interactivity push the ownership of brands futher and further into the hands of the consumer. Brands, promises, products, as labeled here, are no longer things purely crafted by senior management, brand managers, or designers. 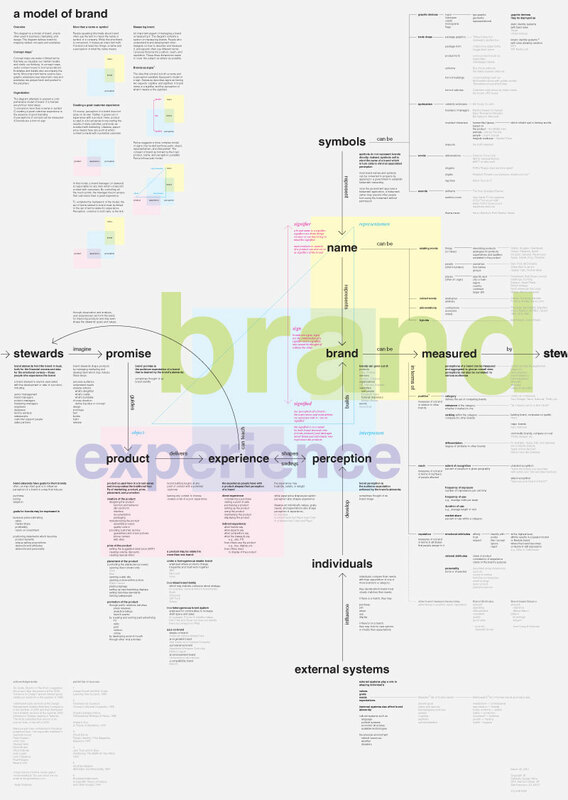 Brands are shaped and “stewarded” (is that a word?) in realtime with a huge role played by the consumer, now more than ever. Max, I don’t think that real brands were ever “crafted by senior management, brand managers, or designers.” A brand is something that exists and is true about the company. It’s a core idea that exists in the soul of the company and the mind of the consumer. If the above mentioned leaders are successful at building brand it’s because they found it and stuck to it. Not because they created it. That’s why it is absolutely critical that those creating companies should be aware that from day one they’re creating brand. If the brand includes valuable ideas, then as the company progresses, those ideas will eventually be re-found and perpetuated by others. It’s on my wall..in a prominent place in the studio. We refer to it often! I love this. I remember looking at it many years ago. 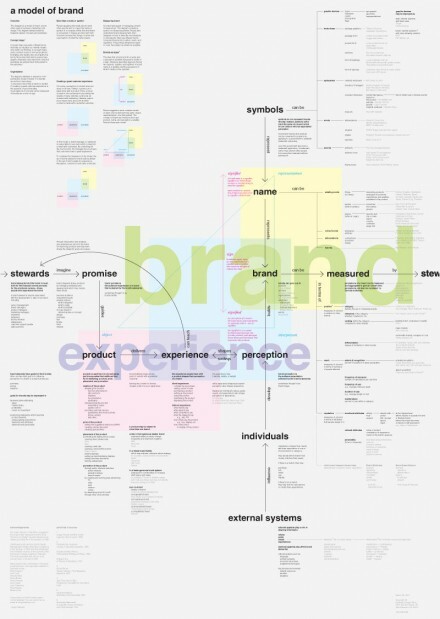 I feel cool about the model, to those people who consider Brand is only a logo / identity design, this model could help them understand how complex and costly that they need to pay for. I hope I can put it on my magazine as a gift to my readers. Great work of design and thought heirarchy, I really enjoyed your 30 page pdf walkthrough. We’ll use this to help us refine our brand. Many thanks for giving this to the world. I partly agree with Jeff Barlow. Brands are really the perception people have about your company. But those perceptions can be influenced and built as long as they come from an authentic place. Branding is the art of discovering the true essence of the company and their unique qualities, then living those truths and consistently reinforcing them in every interaction. Interesting your point of view. I’m a designer and a Marketing Professional. I often wonder what brand is and how to do better management. I really appreciate your concept, but I believe it needs to be tested with research and review. How can we work together to create a truly rich and innovative material?